The second day of the Citizen Cyberlab Summit followed the same pattern of the first day: Two half day sessions, in each one short presentations from guest speakers from outside the project consortium, followed by two demonstrations of specific platform, tool, pilot or learning, and ending with discussion in groups, which were then shared back. This link to a European Research Council (ERC) project – the rise of citizen sciences – on the history of the movement. Is there something like ‘citizen sciences’? From history of science perspective, in the early 20c the amateur scientist is passing and professionals are replacing it. He use a definition of citizen science as amateurs producing scientific knowledge – he is not interested in doing science without the production of knowledge. He noted that there are a lot of names that are used in citizen science research. In particular, the project focus is on experimental sciences – and that because of the laboratory revolution of the 1930s which dominated the 20th century. The lab science created the divide between the sciences and the public (Frankenstein as a pivotal imagery is relevant here). Science popularisation was trying to bridge the gap to the public, but the rise in experimental sciences was coupled with decline of public participation. His classification looks at DIYbio to volunteer computing – identifying observers, analysers etc. and how they become authors of scientific papers. Citizen science is taken by the shift in science policy to science with and for society. Interest in the promises that are attached to it: scientific, educational (learning more about science) and political (more democratic). It’s interesting because it’s an answer to ‘big data’, to the contract of science and society, expertise, participation and democratisation. The difference is demonstrated in the French response following Chernobyl in 1986, with presentation by a leading scientists in France that the particle will stop at the border of France, compared that to Deep Horizon in 2010 with participatory mapping through public lab activities that ‘tell a different story’. In the project, there are 4 core research question: how citizen science transform the relationship between science and society? who are the participants in the ‘citizen sciences’ – we have some demographic data, but no big picture – collective biography of people who are involved in it. Next, what is the ‘moral economies’ that sustain the citizen sciences? such as the give and take that people get out of project and what they want. Motivations and rewards. Finally, how do citizen sciences impact the production of knowledge? What is possible and what is not. He plan to use approaches from digital humanities process. He will build up the database about the area of citizen science, and look at Europe, US and Asia. He is considering how to run it as participatory project. Issues of moral economies are demonstrated in the BOINC use in commercial project. Lifelong learning & DIY AFM – En-Te Hwu (Edwin) from Academia Sinica, Taiwan). There are different ways of doing microscopy at different scales – in the past 100 years, we have the concept of seeing is believing, but what about things that we can’t see because of the focused light of the microscope – e.g. under 1 micron. This is possible with scanning electron microscope which costs 500K to 2M USD, and can use only conductive samples, which require manipulation of the sample. The Atomic Force Microscope (AFM) is more affordable 50K to 500K USD but still out of reach to many. This can be used to examine nanofeatures – e.g. carbon nanotubes – we are starting to have higher time and spatial resolution with the more advanced systems. Since 2013, the LEGO2NANO project started – using the DVD head to monitor the prob and other parts to make the AFM affordable. They put an instructable prototype that was mentioned by the press and they called it DIY AFM. They created an augmented reality tool to guide people how to put the device together, and it can be assembled by early high school students – moving from the clean room to the class room. The tool is being used to look at leafs, CDs – area of 8×8 microns and more. The AFM data can be used with 3D printing – they run a summer school in 2015 and now they have a link to LEGO foundation. They are going through a process of reinventing the DIY AFM, because of patenting and intellectual property rights (IPR) – there is a need to rethink how to do it. They started to rethink the scanner, the control and other parts. They share the development process (using building process platform of MIT media lab). There is a specific application of using the AFM for measuring air pollution at PM2.5. using a DVD – exposing the DVD by removing the protection layer, exposing it for a period of time and then bringing it and measuring the results. They combined the measurements to crowdcrafting for analysis. The concept behind the AFM is done by using LEGO parts, and scanning the Lego points as a demonstration, so students can understand the process. The morning session included two demonstrations. 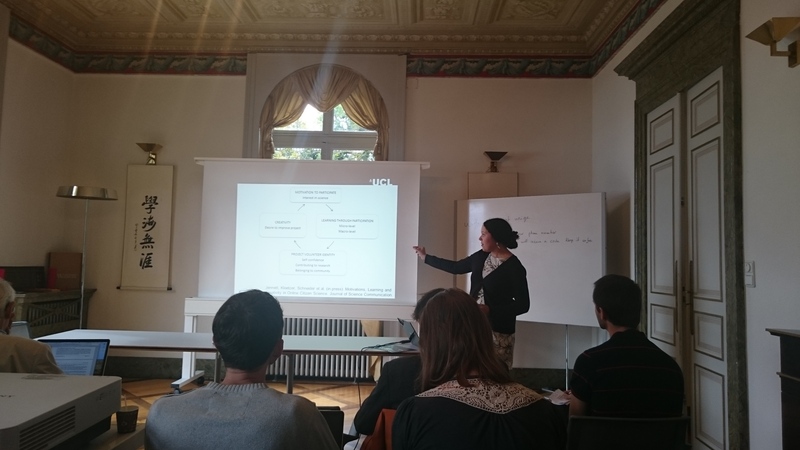 First, Creativity in Citizen Cyberscience – Charlene Jennett (UCLIC, UCL) – Charlene is interested in psychological aspects of HCI. Creativity is a challenge in the field of psychology. Different ideas of what is creativity – one view is that it’s about eureka moment as demonstrated in Foldit breakthrough. However, an alternative is to notice everyday creativity of doing thing that are different, or not thought off original. In cyberlab, we are looking at different projects that use technologies and different context. In the first year, the team run interviews with BOINC, Eyewire, transcribe Bentham, Bat Detective, Zooniverse and Mapping for Change – a wide range of citizen science projects. They found many examples – volunteers drawing pictures of the ships that they were transcribing in Old Weather, or identifying the Green Peas in Galaxy zoo which was a new type of galaxy. There are also creation of chatbots about their work -e.g. in EyeWire to answer questions, visualisation of information, creating dictionaries and further information. The finding showed that the link was about motivation leading to creativity to help the community or the project. They created the model of linking motivation, learning through participation, and volunteer identity that lead to creativity. The tips for projects include: feedback on project progress at individual and project level, having regular communication – forum and social media, community events – e.g. competitions in BOINC, and role management – if you can see someone is doing well, then encourage them to take more responsibility. The looked at the different pilots of Cyberlab – GeoTag-X, Virtual Atom Smasher, Synthetic Biology through iGEM and Extreme Citizen Science. They interview 100 volunteers. Preliminary results – in GeoTag-X, the design of the app is seen as the creative part, while for the analysts there are some of the harder tasks – e.g. the georeferencing of images and sharing techniques which lead to creative solutions. In the iGEM case they’ve seen people develop games and video. in the ExCiteS cases, there is DIY and writing of blog posts and participants being expressive about their own work. There are examples of people creating t-Shirt, or creating maps that are appropriate for their needs.They are asking questions about other projects and how to design for creativity. It is interesting to compare the results of the project to the definition of creativity in the original call for the project. The cyberlab project is opening up questions about creativity more than answering them. 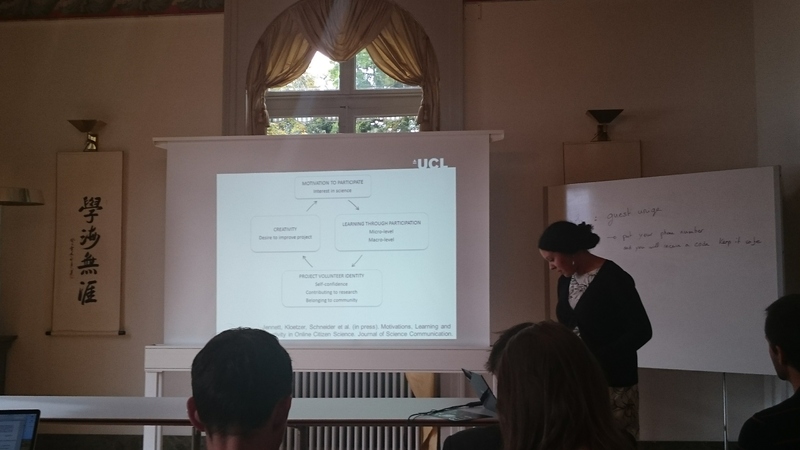 Preliminary Results from creativity and learning survey – Laure Kloetzer (university of Geneva). One of the aims of Citizen Cyberlab was to look at different aspects of creativity. The project provided a lot of information from a questionnaire about learning and creativity in citizen science. The general design of the questionnaire was to learn the learning outcomes. Need to remember that out of the whole population, small group participate in citizen science – and within each project, there is a tiny group of people that do most of the work (down to 16 in Transcribed Bentham) and the question of how people turn from the majority, who do very little work to highly active participants is unknown, yet. In Citizen Cyberlab we carried out interviews with participants in citizen science projects, which led to a typology of learning outcomes – which are lot wider than those that are usually expected or discussed in the literature – but they didn’t understand what people actually learn. The hypothesis is that people who engage with the community can learn more than those that doesn’t – the final questionnaire of the project try to quantify learning outcomes (informal learning in citizen science – ILICS survey). The questionnaire was tested in partial pilot. Sent to people in volunteer computing, volunteer thinking and others types. They had about 700 responses, and the analysis only started. 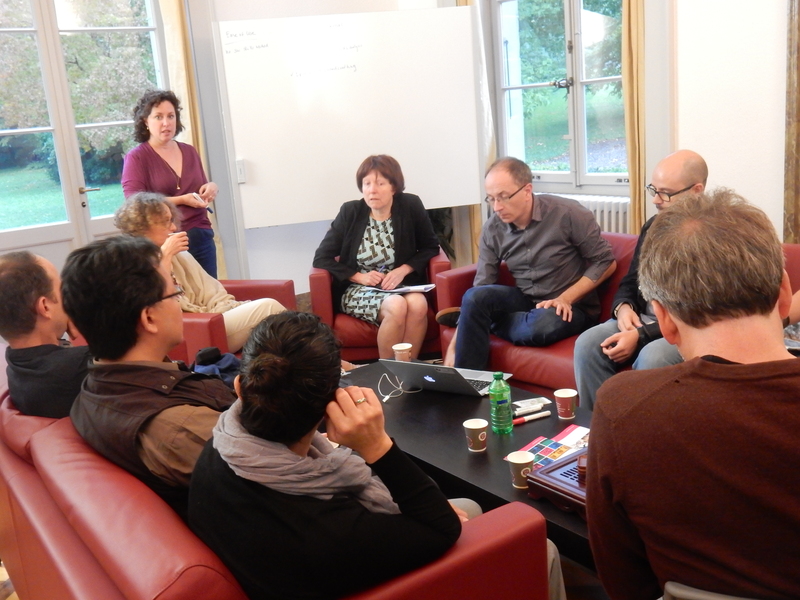 Results – age group of participants is diverse from 20-70, but need to analyse it further according to projects. Gender – 2/3 male, third female, and 20% of people just have high school level of education, with 40% with master degree or more – large minority of people have university degree. They got people from 64 countries – US, UK, Germany and France are the main ones (the survey was translated to French). Science is important to most, and a passion for half, and integrated in their profession (25% of participants). Time per week – third of people spend less than 1 hour, and 70% spend 1-5 hours – so the questionnaire captured mostly active people. Results on learning – explore feeling, what people learn, how they learn and confidence (based on the typology from previous stages of the project). The results show that – people who say that they learn something to a lot, and most people accept that they learn on-topic knowledge (about the domain itself – 88%), scientific skills (80%), technological skills (61%), technical skills (58%), with political, collaboration skills and communication skills in about 50% of the cases. The how question – people learn most from project documentation (75%) but also by external resources (70%). Regarding social engagement, about 11% take part in the community, and for 61% it’s the first time in their life that they took such a role. There are different roles – translation, moderating forums with other things in the community that were not recognised in the questionnaire. 25% said that they met people online to share scientific interests – opportunity to share and meet new people. Learning dimensions and types of learners – some people feel that they learn quite a lot about various things, while others focus on specific types of learning. Principal Component Analysis show that learner types correlate with different forms of engagement – more time spent correlate to specific type of learner. There are different dimensions of learning that are not necessarily correlate. The cluster analysis show about 10 groups – people who learn a lot on-topic and about science with increase self-confidence. Second group learn on topic but not much confidence. Group 3, like 2 but less perception of learning. Group 4 don’t seem to learn much but prefer looking at resources. 5 learn somewhat esp about computers. 6 learn through other means. 7 learn by writing and communicating, collaborating and some science. 8 learn only about tools, but have general feeling of learning. 9 learn on topic but not transferable and 10 learn a lot on collaboration and communication – need to work more on this, but these are showing the results and the raw data will be shared in December. Following the presentation, the group discussion first explored examples of creativity from a range of projects. In crowdcrafting, when people are not active for a month, they get email with telling them that they will be deleted – one participant created activities that link to the project – e.g. tweeting from a transcriptions from WW I exactly 100 years after it happen. In Cornell Lab of Ornithology, volunteers suggest new protocols and tasks about the project – new ways of modifying things. In the games of ScienceatHome are targeted specifically to explore when problem solving become creative – using the tools and explaining to the researchers how they solve issues. In WCG one volunteered that create graphics from the API that other volunteers use and expect now to see it as part of the project. There is a challenge to project coordinators what to do with such volunteers – should they be part of the core project? Next, there are questions about roles – giving the end users enough possibilities is one option, while another way is to construct modularising choices, to allow people to combine them in different ways. In ScienceatHome they have decided to put people into specific modes so consciously changing activities. There is wide variety of participants – some want to be fairly passive and low involvement, while other might want to do much more. Also creativity can express itself in different forms, which are not always seem linked to the project. The learning from Citizen Cyberlab is that there isn’t simple way of linking creativity and capture it in computer software, but that you need organisational structure and most importantly, awareness to look out for it and foster it to help it develop. Having complementarity – e.g. bringing game people and science people to interact together is important to creativity. Another point is to consider is to what degree people progress across citizen science projects and type of activities – the example of Rechenkraft.net that without the hackspace it was not possible to make things happen. So it’s volunteers + infrastructure and support that allow for creativity to happen. There are also risks – creating something that you didn’t know before – ignorance – in music there isn’t much risk, but in medical or synthetic biology there can be risks and need to ask if people are stopping their creativity when they see perceived risks. The final session of the summit was dedicated to Evaluation and Sustainability. 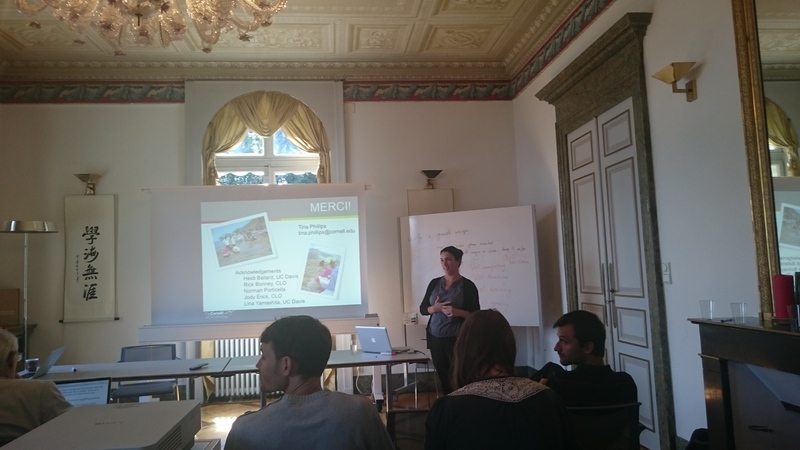 Starting with The DEVISE project – Tina Philips (Cornell Lab of Ornithology). Tina is involved in the public engagement part of Cornell Lab of Ornithology . Starting from the work on the 2009 of the Public Participation in Scientific Research (PPSR) report – the finding from the CAISE project that scarcity of evaluations, higher engagement suggested deeper learning, and need for a more sensitive measures and lack of overall finding that relate to many projects. The DEVISE project (Developing, Validating, and Implementing Situated Evaluation Instruments) focused on evaluation in citizen science overall – identifying goals and outcomes, building professional opportunities for people in the field of informal learning, and creating a community of practice around this area. Evaluation is about improving the overall effectiveness of programmes and projects. Evaluation is different from research as it is trying to understand strengths and weaknesses of the specific case and is less about universal rules – it’s the localised learning that matter. In DEVISE, they particularly focused on individual learning outcomes. The project used literature review, interviews with participants, project leaders and practitioners to understand their experience. They looked at a set of different theories of learning. This led to a framework for evaluating PPSR learning outcomes. The framework includes aspects such as interest in science & the environment, self efficacy, motivation, knowledge of the nature of science, skills of science inquiry, and behaviour & stewardship. They also develop scales – short surveys that allow to examine specific tools – e.g. survey about interest in science and nature or survey about self-efficacy for science. There is a user guide for project evaluators that allow to have plan, implement and share guidance. There is a logic model for evaluation that includes Inputs, activities, outputs, short-term and long-term impacts. It is important to note that out of these, usually short and long terms outcomes are not being evaluated. Tina’s research looked at citizen science engagement, and understand how they construct science identity. 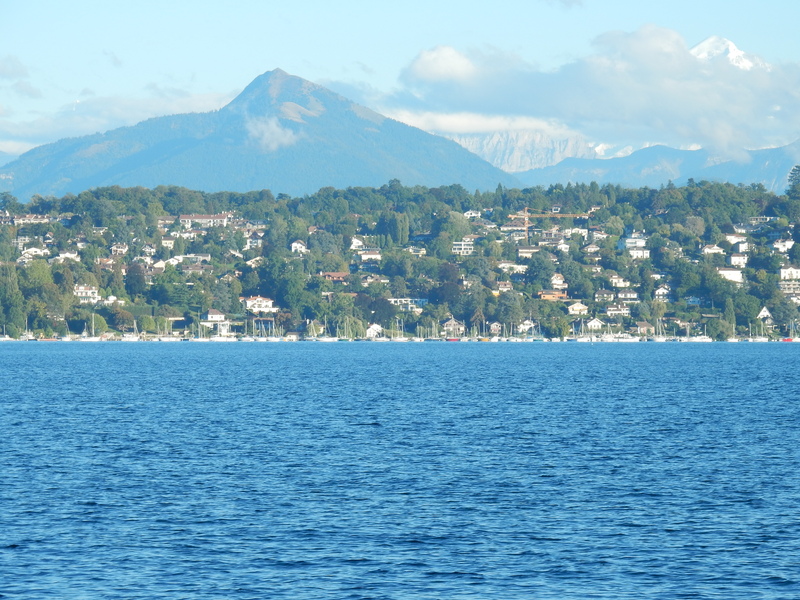 Together with Heidi Ballard, they looked at contributory, collaborative and co-created projects – including Nestwatch, CoCoRaHS, and Global Community Monitor. They had 83 interviews from low , medium and high contributors and information from project leaders. The data analysis is using qualitative analysis methods and tools (e.g. Nvivo). The interview asked about engagement and what keep participants involved and asking about memorable aspects of their research involvement. There are all sort of extra activities that people bring into interviews – in GCM people say ‘it completely changes the way that they respond to us and actually how much time they even give us because previously without that data, without something tangible’ – powerful experiences through science. The interviews that were coded show that data collection, communicating with others and learning protocols are very common learning outcomes. About two-third of interviewees are also involved in exploring the data, but smaller group analyse and interpret it. Majority of people came with high interest in science, apart of the people who are focused on local environmental issues of water or air quality. Lower engagers tend to feel less connected to the project – and some crave more social outlets. The participants have a strong understanding of citizen science and their role in it. Data transparency is both a barrier and facilitator – participants want to know what is done with their data. QA/QC is important personally and organisationally important. Participants are engaged in wide range of activities beyond the project itself. Group projects may have more impact than individual projects. Following the presentation, the discussion explore the issue of data – people are concerned about how the data is used, and what is done with it even if they won’t analyse it themselves. In eBird, you can get your raw data, and checking the people that used the data there is the issue of the level in which those who download the data understand how to use it in an appropriate way. 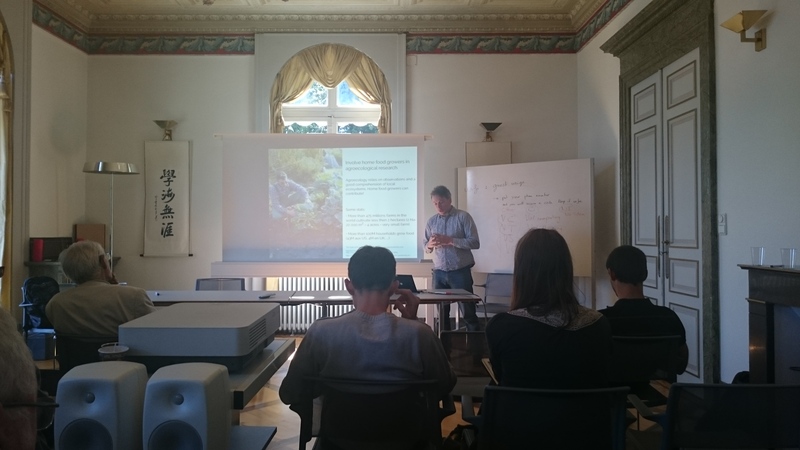 The final guest presentation was Agroecology as citizen science – Peter Hanappe (Sony Computer Science Lab, Paris). Peter is interested in sustainability, and in previous projects he was involved in working on accessibility issues for people who use wheelchair, the development of NoiseTube, or porting ClimatePrediction BOINC framework to PlayStation, and reducing energy consumption in volunteer computing. In his current work he looks at sustainability in food systems. Agroecology is the science of sustainable agriculture, through reducing reliance on external inputs – trying to design productive ecosystems that produce food. Core issues include soil health and biodiversity, with different ways of implementing systems that will keep them productive. The standard methods of agriculture don’t apply, and need to understand local conditions and the practice of agroecology is very knowledge intensive. Best practices are not always studied scientifically – with many farms in the world that are small (below 2 hectares, 475 millions farms across the world). There are more than 100M households around the world that grow food. This provide the opportunity for citizen science – each season can be seen as an experiment, with engaging more people and asking them to share information so the knowledge slowly develops to provide all the needed details. Part of his aim is to develop new, free tools and instruments to facilitate the study of agroecology. This can be a basic set with information about temperature and humidity or more complex. The idea to have local community and remote community that share information on a wiki to learn how to improve. Together with a group of enthusiasts that he recruited in Paris, they run CitizenSeeds where they tried different seeds in a systematic way – for example, with a fixed calendar of planting and capturing information People took images and shared information online. The information included how much sunlight plants get and how much humidity the soil have. on p2pfoodlab.net they can see information in a calendar form. They had 80 participants this year. Opportunity for citizen science – challenges include community building, figuring out how much of it is documentation of what worked, compared to experimentation – what are the right way to carry out simple, relevant, reproducible experiments. Also if there is focus on soil health, we need multi-year experiments. I opened the last two Demonstrations of the session with a description of the Extreme Citizen Science pilots – starting similarly to the first presentation of the day, it is useful to notice the three major period in science (with regard to public participation). First, the early period of science when you needed to be wealthy to participate – although there are examples like Mary Anning, who. for gender, religion and class reasons was not accepted within the emerging scientific establishment as an equal, and it is justified to describe her as citizen scientists, although in full time capacity. However, she’s the exception that point to the rule. More generally, not only science was understood by few, but also the general population had very limited literacy, so it was difficult to engage with them in joint projects. During the period of professional science, there are a whole host of examples for volunteer data collection – from phenology to meteorology and more. As science became more professional, the role of volunteered diminished, and scientists looked for automatic sensors as more reliable mean to collect information. At the same time, until the late 20th century, most of the population had limited education – up to high school mostly, so the tasks that they were asked to perform were limited to data collection. In the last ten years, there are many more people with higher education – especially in industrialised societies, and that is part of the opening of citizen science that we see now. They can participate much more deeply in projects. Yet, with all these advances, citizen science is still mostly about data collection and basic analysis, and also targeted at the higher levels of education within the population. Therefore, Extreme Citizen Science is about the extremities of citizen science practice – engage people in the whole scientific process, allow them to shape data collection protocols, collect and analyse the data, and use it in ways that suit their goals. It is also important to engage people from all levels of literacy, and to extend it geographically across the world. The Extreme Citizen Science (ExCiteS) group is developing methodologies that are aimed at facilitating this vision. Tool like GeoKey, which is part of the Cyberlab project, facilitate community control over the data and decision what information is shared and with whom. Community Maps, which are based on GeoKey are way to allow community data collection and visualisation, although there is also a link to EpiCollect, so mobile data collection is possible and then GeoKey managed the information. These tools can be used for community air quality monitoring, using affordable and accessible methods (diffusion tubes and borrowed black carbon monitors), but also the potential of creating a system that will be suitable for people with low level of literacy. Another pilot project that was carried out in Cyberlab included playshops and exploration of scientific concepts through engagement and play. This also include techniques from Public Lab such as kite and balloon mapping, with potential of linking the outputs to community maps through GeoKey. 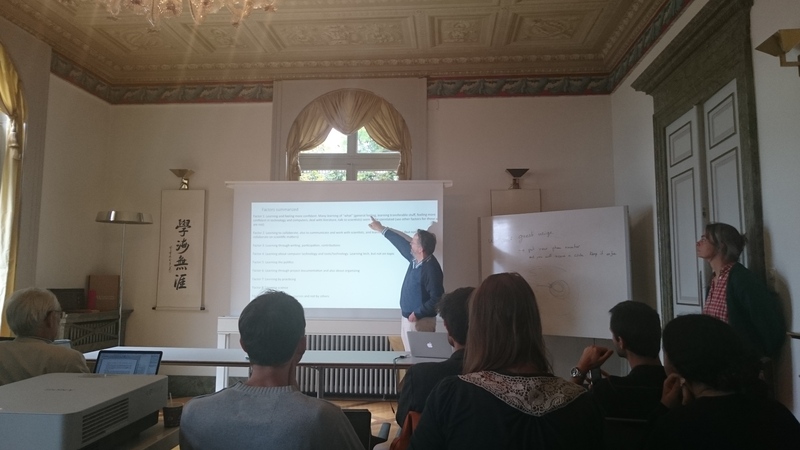 Finally, CCL Tracker was presented by Jose Luis Fernandez-Marquez (CERN) – the motivations to create the CCL tracker is the need to understand more about participants in citizen cyberscience projects and what they learn. Usual web analytics provide information about who is visiting the site, how they are visiting and what they are doing. Tools like Google analytics – are not measuring what people do on websites. We want to understand how the 20% of the users doing 80% of the work in citizen cyberscience projects and that require much more information. Using an example of Google Analytics from volunteer computing project, we can see about 16K sessions, 8000 users, from 108 countries and 400 sessions per day. Can see that most are males – we can tell which route they arrived to the website, etc. CCL tracker help to understand the actions performed in the site and measure participants contribution. Need to be able to make the analytics data public and create advanced data aggregation – clustering it so it is not disclosing unwanted details about participants. CCL tracker library work together with Google tag manager and Google analytics. There is also Google Super Proxy to share the information.